In celebration of the Fourth of July, we would like to highlight two ensembles from the collection that feature the iconic red, white and blue seen everywhere in the US on this date of the country’s anniversary of Independence Day. These three colors are not without meaning. The colors of the flag were chosen to represent particular American ideals. Red symbolizes hardiness and valor while white represents purity and innocence. Finally, blue symbolizes vigilance, perseverance and justice. The first official flag was adopted by the Continental Congress on June 14, 1777. The current version of the flag was approved with the addition of Hawaii as the 50th state in 1960. 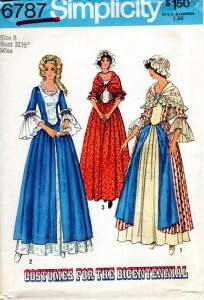 While it is common for Americans to wear the colors of the flag in celebration of Independence Day, it was particularly popular in 1976 as the U.S. celebrated its bicentennial. 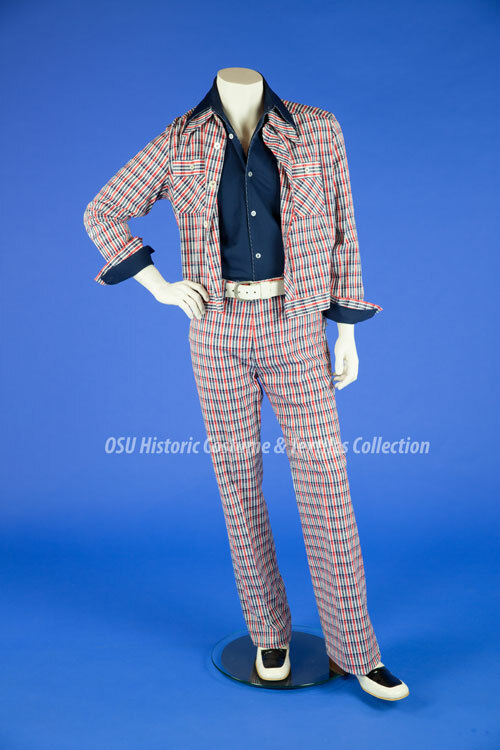 This suit exemplifies the craze for patriotic fashion during 1976. As America celebrated its 200th anniversary, many people chose to express their patriotism through a marriage of red, white and blue with popular fashion. This leisure suit is a cotton/polyester blend paired with a navy blue polyester shirt, white belt and white/black patent leather loafers. This style was also known as the “Full Cleveland”. The “Full Cleveland” was a man’s leisure suit paired with a white belt and shoes. 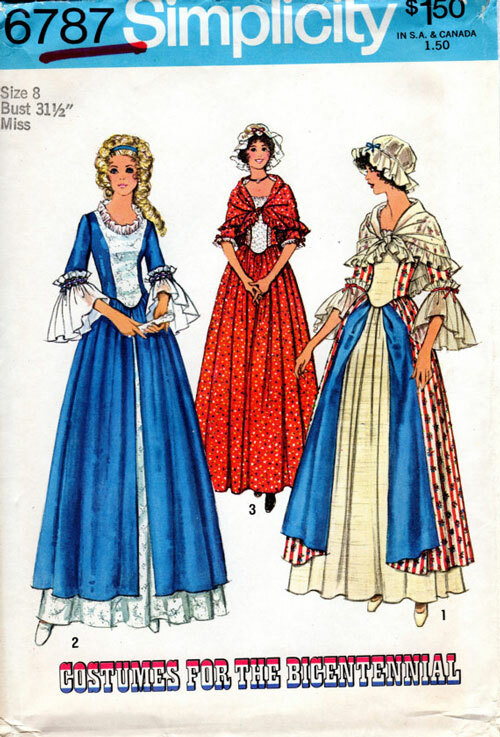 If you preferred to wear a patriotic but historically inaccurate costume for the Bicentennial there were commercial patterns, such as this one from Simplicity, available for the home sewer. 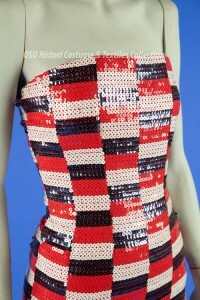 This strapless sequin dress was produced in 1985 and donated to thecollection by the designer, Arnold Scaasi, himself. While not designed in direct reference to Independence Day, it certainly utilizes the patriotic color scheme of the U.S. flag. Arnold Scaasi is considered an American designer, and was a favorite of first ladies Barbara and Laura Bush as well as Mamie Eisenhower and Ladybird Johnson. You can’t get more patriotic than that! Scaasi’s is an interesting story. His surname would indicate he is perhaps Italian, but Arnold Scaasi was born in Canada and not with that surname. In 1954 Robert Denning, a friend working on the General Motors advertising campaign which featured models wearing gowns designed by Scaasi, told him they had reversed his name in the caption because it had an Italian flavor and Italian fashions were all the rage that year. Look magazine considered him “one of America’s promising young designers” in 1955, and in 1958 he won the Coty American Fashion Critics Award and was compared to Dior. The popularity of his designs in the 1980s stemmed largely from a fashion revival of voluminous 1950s style gowns, a form at which he excelled. No matter what you choose to wear this weekend, just remember to have fun and be safe celebrating the 4th!